Frankfurt 2011: SEAT IBL shows new design direction. 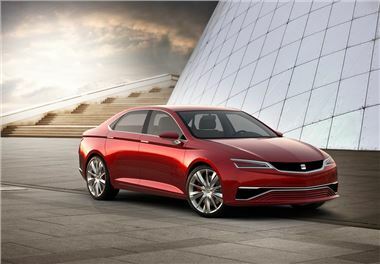 The new IBL sports saloon concept shows the new styling direction for Spanish brand and Volkswagen Group member SEAT. The plug-in hybrid model features a low, dynamic roofline and distinctive full-LED headlamps, with the usual SEAT sportiness enhanced by 20-inch alloy wheels. Matte finish leather dominates the interior of the four-seater, which is designed to be light and minimalist. The driver oriented cockpit features a one-piece curved glass instrument panel which stretches from behind the steering wheel all the way to the top of the centre console, combining functions like the speedo and tachometer, which can be presented in digital or analogue form, with the driver’s preferred readouts. The information system changes colour depending on the selected programme – ‘travel,’ ‘sport,’ and ‘efficiency’ modes are available. There’s also an extensive multimedia and communications system, including Google Earth enable sat-nav. For more from the 2011 Frankfurt Motor Show, click here.